JAN HUS’S STATUS as a forgotten figure becomes a problem when you start looking for more information about him—unless you read Czech or really enjoy using inter-library loan. This list will at least get you started. The big name in English—language Hus studies is Matthew Spinka, a native Bohemian Protestant who later taught church history at Hartford Theological Seminary. His John Hus: A Biography (Princeton, 1968), published after his retirement, is the definitive biography, and John Hus’ Concept of the Church (Princeton, 1966), based heavily on primary sources, illuminates the subject’s nuanced theology. Spinka also contributed greatly to the field as an editor and translator. 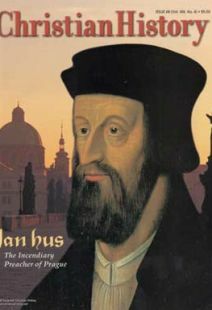 The Letters of Jan Hus (Manchester, 1972) contains all 105 surviving letters and documents relating to Hus. John Hus at the Council of Constance (Columbia, 1965) features an eyewitness account of Hus’s trial and execution, as well as a lengthy introduction on the conciliar movement and a selection of relevant letters and documents. Before Spinka, the best known Hus scholar in America was David S. Schaff, a professor of church history at Western Theological Seminary. His translation of Hus’s most influential book, De Ecclesia (The Church) (Scribner’s, 1915), is the best available. Schaff also published a biography,John Huss (Scribner’s, 1915), which, though dated, is very readable and offers some shrewd insights. Spinka made such a mark in Hus studies that no one else attempted a full English study for more than 30 years. Then in 1998, Thomas A. Fudge (the author of “To Build a Fire,” page 10) published The Magnificent Ride: The First Reformation in Hussite Bohemia (Ashgate). Fudge begins with a look at Hus, then focuses on the Hussite political and theological campaign that gained speed after the reformer’s death. Fudge has also published articles on Hus in the journals Communio Viatorum (No. 2, 1993) and Fides et Historia (No. 1, 1998). Another interesting book, if you can find it, is The Hussite Revolution by Jerí Kejr (Orbis Press Agency, 1988). Though difficult to follow in spots—our hardbound copy is actually missing about 20 pages—the translated manuscript is decent and the images are stunning. Since the list of books specifically on Hus or the Hussites is short, chapters in overview works help to add breadth. For this issue, R. R. Betts’s Essays in Czech History (Athlone Press, 1969) and Malcolm Lambert’s Medieval Heresy (Blackwell, 1992) were very useful. Volume 7 in The New Cambridge Medieval History (Cambridge, 1998), edited by Christopher Allmand, and volume 6 of Dictionary of the Middle Ages (Scribner’s, 1978), edited by James Strayer, are relevant as well. The drama of Hus’s life and death plays out in the 55—minute film John Hus (Gateway, 1980), which was the inspiration for Christian History issue 0. It’s available from Vision Video.